My first official post on my blog. *YAY* It's been a long time coming. And here I have a new series, Swatch & Review. 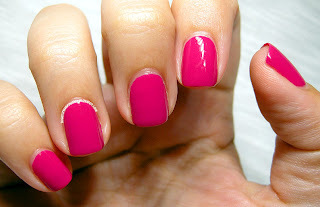 In this series I will share swatches and my opinions on the polishes I have in my collection. Today I have one of my favorites for you! Make An Entrance is fuchsia mixed with a touch of blue, leaving you with a bright, berry fuchsia. It is a beautiful color that I would wear any time of the year, though it is specifically stunning in the spring. The longevity of this polish is amazing. I took these pictures on day 4 and as you can see there are hardly any signs of wear. 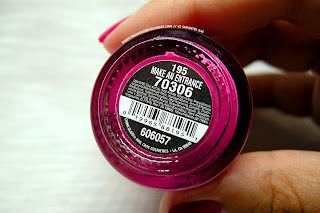 A great polish for instances in which I don't want to fuss with my nails for a few days. 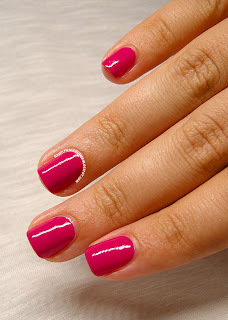 I can easily paint my nails and leave them without any worry of them chipping. The formula is great, too. 2 coats that applied effortlessly and covered like a dream. There is no fussing with this polish! The consistency is fantastic as well. Not too thick or runny. I love it! I really can't say anything bad about Make An Entrance. It is one of my favorite go-to polishes. A staple in my collection that I seriously can't live without. Definitely a must have in my book! Hi! I would like to open beauty salon. Does anybody have an experience in this business? There are too many options in different salon equipment. Could anybody give me an advise? What store is more reliable to buy Uv towel warmer and Mini uv hot towel warmer. I'm choosing between Advance-Esthetic.Com and Spa&Equipment websites.